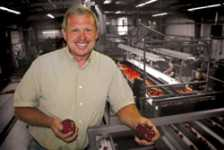 Watermill was founded in 2005 by the Brown family of Milton-Freewater, commercial apple growers who have been farming in the Walla Walla Valley for more than a century. With the planting of their first vineyard on family land in 2001, Anna Marie Vineyard, the Browns pledged to grow only the highest quality fruit using sustainable and wildlife-safe farming practices. The foray into grape growing led to the establishment of the winery under the supervision of famed local winemaker Rich Funk of Saviah Cellars, whose wine showcased the grape growing perfection of the Walla Walla Valley and the effort the Brown family put into their grapes. In the following years more estate vineyard land was added, including the family's first planting in the unique region that was later to be designated as the Rocks District of Milton-Freewater AVA, the aptly named Watermill Vineyard. The family also expanded into the fermentation of estate fruit by founding our sister company, Blue Mountain Cider Company, around the same time. Andrew Brown, a second generation of the Brown family member, took over as head of production in 2008 and has continued on with making wines that express the quality of the estate fruit and world class winemaking. In the summer of 2017 the Brown family decided to partner with the Foreman and Kleinman families, commercial apple growers from Wenatchee, to form an agricultural partnership of orchards and vineyards that spans from Oregon to the Canadian border. This partnership ushers in a new era for Watermill that represents positive growth and opportunity for the winery to expand its reach without sacrificing quality and its family owned roots. The winery continues to be a small volume producer of premier wines from estate fruit from four different appellations all located in the Pacific Northwest.